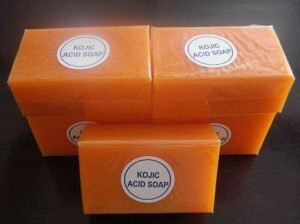 Kojic acid has been in the market for quite some time now. It has been very popular in the beauty industry. Many beauty products such as facial creams, under eye treatments, facial cleansers and anti-aging products contain kojic acid. The use of kojic acid originates in Japan where it used in the fermentation of sake (rice wine). Kojic acid comes from mushrooms, specifically, Aspergilllus oryzae, commonly known as koji in Japan. Aside from rice wine fermentation, kojic acid is also popularly used in making soy sauce, miso, salted black beans and a host of fermented food products. Kojic acid mainly inhibits the release of tyrosinase, an enzyme that helps regulate melanin production. It goes into the deeper layers of the skin and minimizes the production of melanin. Those with hyperpigmentation problems can greatly benefit from using kojic acid soap and other beauty products containing the said ingredient. Aside from controlling melanin production, kojic acid also has anti-bacterial properties, which makes it a good staple for those with pimple prone skin. Kojic acid is also an anti-oxidant, which is why it is a common ingredient in anti-aging products. Additionally, due to its anti-oxidant properties, it is also used in food and flower preservation. Does it Help Erase Scars? Some people swear that kojic acid is effective in removing scars. However, it depends on the age, size and nature of the scar. Kojic acid is effective in targeting dark marks caused by insect bites, acne and pimples. Unfortunately, it cannot help flatten keloids and bulging scars. It exfoliates the skin; therefore, any blemish found in the surface of the skin can be removed. Regular use of kojic acid can heighten the skin’s sensitivity to the sun. Therefore, it is advised that you stay away from sunlight as much as you can to avoid skin irritation. Depending on the amount of kojic acid in a product, it can sometimes produce a stinging sensation when applied to the skin. People with sensitive skin will often have this sensation. If you have sensitive skin, make sure to choose a product containing topical corticosteroids to counteract any irritation. Increased sensitivity may also cause rashes, bumps, dry patches, blisters, itchiness and even pain. Some cases of sensitization may be mistaken for poison ivy contact dermatitis. How Long Before Kojic Acid Effects Become Visible? It would take around three months to actually see any improvements in your skin. Some users will find that it makes the skin appear too light with prolonged use. However, as soon as you discontinue its use, your skin will return to its normal pigmentation.